Did you know that there are 1000 unpronounceable chemicals in your baby’s lotion? Have you thought about what medicines do to your gut? Look into essential oils! Why are you using that shampoo? Your hair might look great, but you’re going to get cancer! Natural baby shampoos often contain essential oils for fragrance (mine does). But you can’t just use any essential oil. Some essential oils are so dangerous for your children that Poison Control actually recommends you throw out essential oils if you have a baby at home. Be careful! I’ve tried to switch many of our cleaning supplies to natural solutions that are friendlier to the environment. I’m 100% in favor of ditching all the poisons we regularly use and replacing them with vinegar. Vinegar rocks! And its odor dissipates, much to my husband’s relief! But sometimes, you need the strong stuff. Bleach still wins when you have mildew. Mold and mildew can cause so many health problems that you don’t want to play around with them–go after them with a vengeance! To keep bleach fumes from burning your brain cells, use a respirator with organic vapor cartridges. While most healthy pregnancies would benefit from a clean-eating, low-medicine regimen, not all pregnancies are healthy. If you have a high-risk pregnancy or can’t stop vomiting, you may be putting your baby at risk by refusing medicine. I have to admit that I did this during my pregnancy with hyperemesis gravidarum. No medicine for me for weeks at a time, as I vomited everything I ate or drank. Although I eventually had to regularly pop a pill during the second trimester in order to stop losing weight and protect the baby, I fought against it for as long as I could. Now, I realize that my stubbornness, while intended to protect my baby, could have actually hurt him if I had stayed dangerously dehydrated. Ultimately, while natural is preferred, not everyone can or should take that route. Natural is always better. We’ve agreed to that–but maybe we’ve been premature. While going green in every area of your life will help the environment and your health in most cases, sometimes you have to take advantage of modern inventions. Bleach, antibiotics, and that stylist shampoo are not the enemy. Let’s go plant-based and natural where we can, but let’s not make Natural our lord and master. Natural is nice, but as I like to say, this is earth, which is already far less than ideal. I frequently have to think this way as the mother of a tube-fed child. I could have insisted on natural feeding methods only, which probably wouldn’t have turned out too well. Sometimes the “unnatural” is also a blessing from God. Totally agree! Going natural is a good thing. 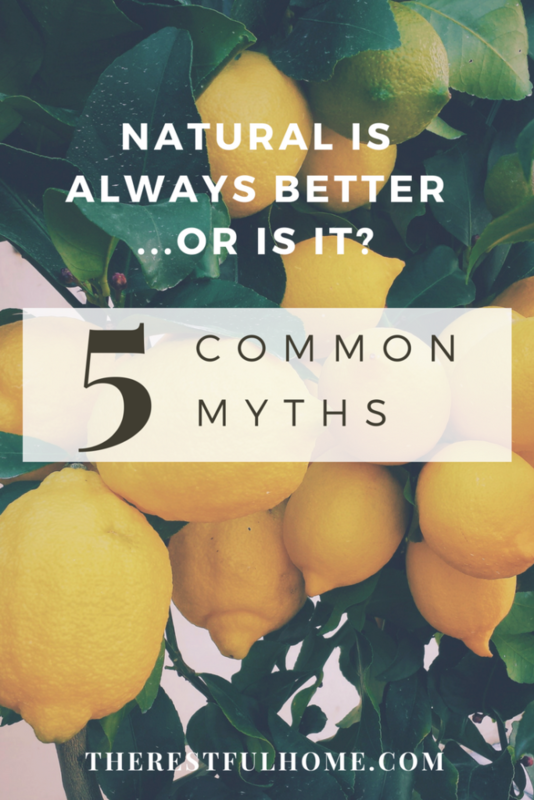 But as much as we want to go natural all the way, there are some aspects that we should keep “unnatural” for the better. Good read! Keep up the good work! Thanks for the encouragement, Danica!